When you have multiple categories selected, you'll see a summary displayed in a panel on the right-hand side. When you have zero categories selected, the numbers displayed reflect your whole budget. 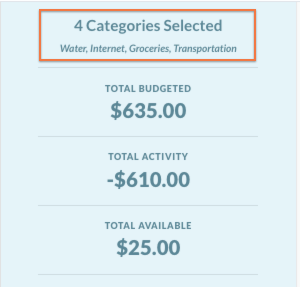 Pro Tip: Check your hidden categories (at the bottom of your budget) if you're having trouble getting the numbers to line up. Pro Tip: This includes money that is set aside for credit card payments. This is the sum of all transactions in cash, checking, and savings accounts categorized as Inflow : To be Budgeted in the current month. This line is only shown when no categories are selected. Pro Tip: This may include outflows that have the Inflow : To be Budgeted category, including balance adjustments made throughout the month. 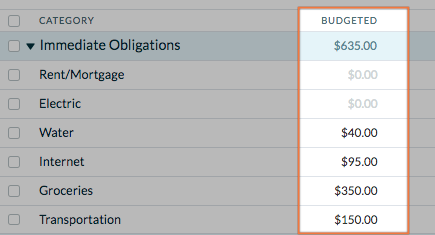 You can also use the Quick Budget options with multiple categories selected to quickly adjust your budget throughout the month!